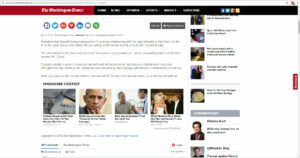 Washington Times website screenshot showing inaccurate depiction of Donald Trump quote. 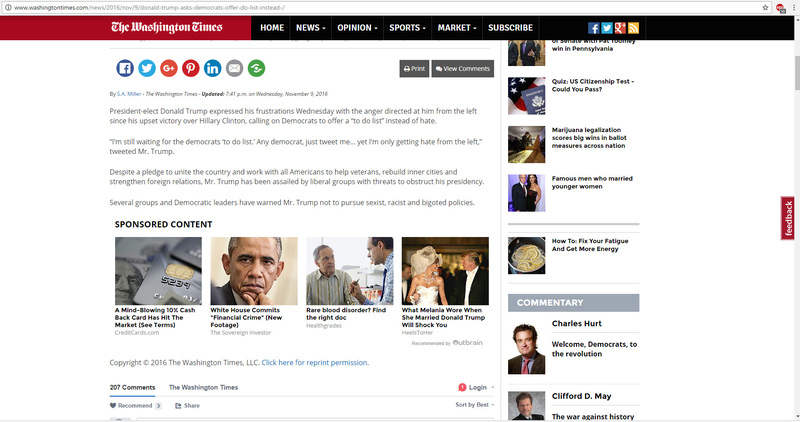 Update 11/10/2016 3:26p CST: The Washington Times has since removed the article in question after it was brought to their attention about the inaccuracies. This still does not excuse the fact it was ever posted in the first place. We will continue monitor and watch these stories as they happen. The problem? The tweet that the article is referring to was not posted by President-Elect Donald Trump’s official twitter account @RealDonaldTrump. It was actually posted by a fake account @RealTrump2016 which has been making several tweets and re-tweeting as an impostor account. With an election cycle where pollsters and the media are under scrutiny for their handling of the Nov. 8 election, this just goes to show why so many Americans continue to be fed up with the mainstream media. It took all of 20 seconds for us to vet the tweet that was posted and the article from the Washington Times, but their journalists; like so many in the media today, lack the moral character or ability to post real news and keep Americans properly informed. It’s the continued era of ‘gotcha’ news and politics that has so many Americans feeling that no one is looking out for their best interests. We will continue to track this post from the Washington Time to see if they will follow up with a correction to their error. For now that, it was last updated today at 7:41 EST.